Just the word can sound scary to a beginner. Or at least I knew it did to me. As a runner, I had always been intrigued by the idea of doing a triathlon, but I wasn’t a biker or swimmer. And the idea of learning how to bike and swim, and then putting them back-to-back-to-back with running during an actual race, was daunting. 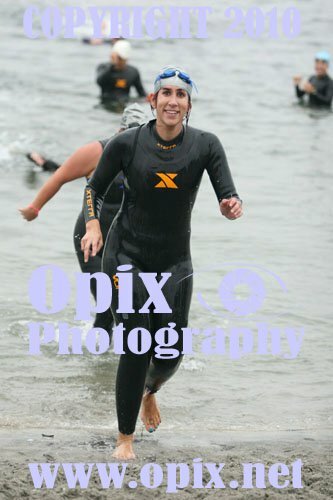 I was finally convinced to give triathlon a try last summer. I kept injuring myself while running, and a friend of mine urged me to start cross-training with biking and swimming as a way to get my sweat on while not putting any impact and stress on my bones. After only one dip in the pool and one spin on the bike, he convinced me to sign up for a sprint triathlon four months away. I began to train almost daily, and by race day I was ready. I had the time of my life, and was so proud of myself when I crossed the finish line. 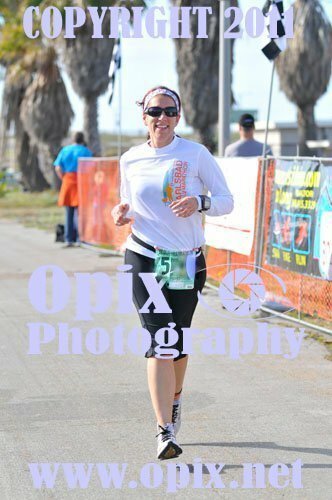 I was finally a triathlete! To date, I have completed 4 sprint triathlons, and am currently training for an Olympic-distance triathlon, which is roughly double the length of a sprint. Gear Triathlon can be as cheap or expensive as you want. At the very least you need the basics. For the swim, you need goggles, a swim cap and a bathing suit. And, of course, you need access to a pool where you can swim laps, whether it’s in your backyard, at a community center, or at the local YMCA. For the bike, you need a bike and helmet. Any kind of bike will do. You will see people racing with specialized triathlon bikes, but you will also see tons of people with regular road bikes. I myself raced my first 2 triathlons with my old hybrid! I have also seen people riding on mountain bikes and even a one-speed cruiser. As long as it has two wheels and you can pedal it, you’re good to go, although the lighter bikes (road and triathlon) are easier to race in. For the run, you need a good pair of running shoes. Get fitted at a specialty running store to ensure you get the shoe that’s right for your feet. I recommend a water bottle for both the bike and the run, as hydration is very important. There are tons of extras you can buy (a wetsuit, paddles, specialized bike shoes and pedals, padded bike shorts, a tri suit, wicking running clothes, a GPS watch, etc) but really, as long as you have the basics I listed above you can train and race. Which race? For a beginner, I recommend signing up for a sprint triathlon, which is the shortest distance. Sprints vary by distance, but most are about a 400-750 meter swim, 20k bike ride, and 5k run (more or less). Check out active.com for a sprint triathlon in your area. Some tris are in a pool, while others are in open water, so keep that in mind as you look for one. At every race I’ve done, there were always tons of beginners. A sprint is a very reachable goal for a newbie. Ask for help Every triathlete had their first triathlon at some point, and most love to help newbies. Ask a friend who does triathlons for pointers. I myself bought “The Complete Idiot’s Guide to Triathlon Training” when I first got started, which was chock-full of great tips. Or join an online community, like Daily Mile, TriathaNewbie, or Beginner Triathlete, where you can ask as many questions as you want and get tons of answers. Train, train, train! The only way to prepare for a triathlon…is to prepare! You need to commit to putting the time in so that you feel ready on race day. Work especially hard on your weakest sports. For me, running was easy, as I was already training for and doing half marathons, but my biking and swimming needed lots of work. I took a few private swim lessons to work on my form and breathing, since I had never swam competitively, only for pleasure. And I had to learn how to really push myself on the bike by not just riding flat courses but finding some hills. If you put the time in and prepare diligently, you will do well on race day. And regardless of how long it takes you, or whether you come in first place, last place, or somewhere in between, you will know that you did all you could to prepare. Transitions Every triathlon has two transitions in addition to the swim, bike and run. You have transition 1 (otherwise known as T1) which is where you transition from the swim to the bike, and transition 2 (T2) where you transition from the bike to the run. Knowing how you will lay your gear out in the transition area and practicing the transition will ease your mind for race day. Know how to quickly strip off your wetsuit and how not to forget to put on your bike helmet! You can find some useful videos about how to set up your transition on youtube.com. Bricks A brick is when you do two consecutive workouts back-to-back without stopping (except for transition). The most popular brick is bike-run, but you can also swim-bike, swim-run, run-swim, etc. I highly recommend a few bike-run bricks before race day as part of your training, as you will find it’s hard to run right after you bike. It typically takes me a good mile or so into the run before I can really feel my legs, which turn into jelly on the bike! Mimic Race Day If you are doing an open water swim (OWS) in a lake, bay or ocean for your triathlon, I urge you to do at least one OWS before the race. Swimming in open water is completely different than swimming in a pool. Instead of clear, chlorinated water with a black line underneath you, ropes on either side of you and a wall at each end, you are in open water which is cold, murky, full of seaweed and tastes weird. Having an OWS experience before you race will greatly help you know what to expect. Also, if you are able to, bike and run on as much of the race course as you can beforehand so you know where the hills and turns are. Have Fun Above all else, have fun, both with the training and the race itself. I myself have never been as fit as when I started triathlon training, and never get bored because every day it’s a different type of workout. Really, I think I have more fun training for triathlons than actually racing them! And crossing the finish line is a moment you will always remember. 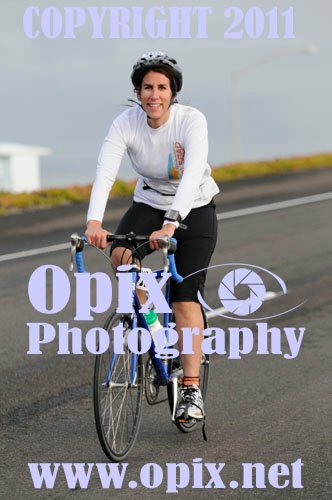 I am a runner-turned-triathlete who can be found swimming, biking and running in San Diego. As a back-of-the-pack athlete, I know the value of having fun during training and races. I originally got into running as a way to combat the heart disease that runs rampant in my family, but am now addicted to getting my sweat on nearly every day. I am a mom to two kids, including one with special medical needs. You can find my blog (where I write about running, triathlon, and parenting) at Grateful Mama or follow me on Twitter, @sugarmagnolia70. QUESTION: Are you ready to try a tri? Lisa’s Note: This was a great, informative post that really makes me want to do a tri! I need to get over my fear of failure and just TRY it! HI Lisa and “Sugar”!! Thanks for the wonderful and informative post. I’m in AWE of people who do Triathlons!!! You are truly super athletes!!! All the best to you both! I am in awe of people who do triathlons. Thanks so much for letting me do a guest post, Lisa! It was fun! You should DEFINITELY sign up for a sprint…just do it! I’m doing my first on September 9th! SO excited. Training has been a lot of fun. Congratulations, Kiki! Which tri are you doing in September? I’d love to hear about it after you participate.